In 1788, James Hutton published the famous Theory of the Earth, in which he talked about the earth as “a machine of a peculiar construction,” its inner components and how they work together to produce “nature;” 200 years later, Marshall McLuhan made the assertion that “the earth is programmable” when commenting on the first Russian artificial satellite Sputnik. For the media theorist, “nature” has ended, and was replaced by an artificial, computational and cybernetic system. The shift of perspective between the inside and the outside no doubt presents us with a new prospect: the earth has never been “unique” or “constant,” but a continually changing entity in a never-ending process of mediatization and remediatization, even gradually represented by a “de-Earthed” imagery. 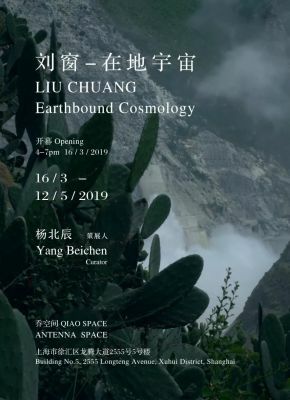 Artist Liu Chuang’s latest solo show Earthbound Cosmology takes up this theme and brings to light the complex situations this planet currently finds itself in: with Geoengineering and “deep-time”, both history and future appear to be so uncertain, and radical media ecology is providing new polyphonic narratives for subjectivity, temporalities and materialities. The show is rather abstract and specific at the same time. Through speculative research, Liu Chuang pulls various seemingly unrelated threads together, or in other words, the show is imbued with structures of speculative montage. Entanglements of scales permeate the show: the reconstruction of planetary scale by global infrastructures, the tension between sonic scale and political powers, the metamorphosis of anthropological scale in science fictions—the mutual effects and cancellations of scales facilitate the transformations between different cosmos. In the video work Bitcoin Mining and Field Recordings of Ethnic Minorities (2018), the artist draws attentions to the connections between the hydraulic projects and the Bitcoin mines in southwest China, whose peculiar chain of exchange between energy and information serves as the beginning of this grand story. The chain is extending, from early informatization projects developed in the late Qing dynasty to workers standing atop optical cables whilst swiping through Kuaishou app, from blockchain to high-speed rails, from Zomia to Solaris, from data to sound, from local to global, this journey is like a “speculative adventure” in Alfred North Whitehead’s terms, a thought experiment aiming to break through epistemological frameworks. Moving image plays a crucial role in this process, three decentralised screens mirror the “escape” from the centre to the margins highlighted in the film. The succession of drone perspective, animation and archival images creates an ecosystem of movement-image with dynamic strata and topography isomorphic to media ecology, which is no longer confined to the forms of representation and documentation. This also applies to the installation work Gluttonous Me (2018), whose interactions between light and sound are not only for creating an atmospheric and immersive space, but an attempt to create a “nonhuman” language of the medium itself. It’s an incarnation of the residue of media memory in EVD and tells a history about this planet in the form of “autobiography”. Full of imaginations and elasticity, the expositions of the Earthbound Cosmology compel us to delve in the fiction the artist has created for the world, and yet the fiction is real, built upon a new ontological dimension, where art may take up the important task of exploring origins and truths once again.